RSS Feeds are down. Try This! 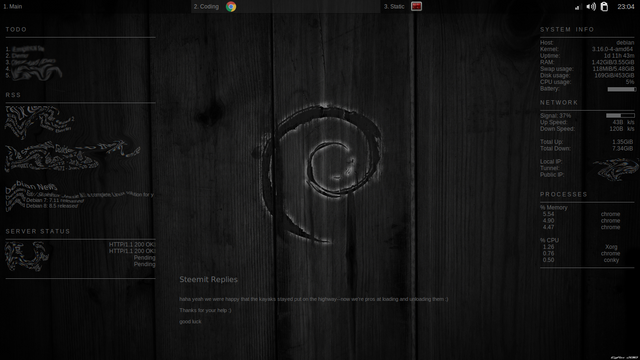 i just started messing around with this in conky to show recent replies on my desktop (blurred some other stuff). Awesome work Xeroc!, Piston is really becoming the powerhouse behind Steem. Imagine the network effect once redditors start posting about the fact that they are making money from the same old post the put on reddit... it wont take long and reddit will need to develop a similar tool to retain new and interesting information that has otherwise migrated to Steemit! Now to get this thing working! This RSS feed needs some help on handling images. If you need my help with just let me know where the code is and I will take a look. I have been building CMS systems for 10 years. I was looking for this information to link Steemit and Twitter. Thank you. Hi @xeroc, Thanks for making the RSS feed service. i was testing with your RSS feed to test a functionality of the Steemit related project i'm working on. and it works very well. Hope you dont mind i use your service in this way. and hope it will not influence anything. @xeroc, would it be possible to update the RSS so it works with Feedly? (And likely other feed readers.) As it stands, Feedly uses the guid tag if isPermalink is set to true, and because this doesn't currently include the steemit.com domain, it defaults to streemian.com rather than steemit.com, so all links in Feedly point there—to a broken link. This can be fixed by changing the isPermalink=true attribute of the guid tag to isPermalink=false, or by inserting the full steemit.com URL as the guid. This seems to be down. Is it going to come back up ? It's not down. For some strange reasons the DNS entry for www is messed up. You can access it directly on streemian.com (without www). How do you send Steem to Steemian to confirm your Steem account? Here's Steemit rss service I developed. I hope it helps. Thank you. I want to get a Raspberry Pi and hook it into a vintage Terminal (like a DEC VT100 or something). Would it be possible to access any aspect of Steemit via this Terminal setup? Just a fun hobby. can you create a rss based on our feed(the people we follow)?